Roger Federer of Switzerland poses with the Norman Brookes Challenge Cup after winning the Men's Final match against Rafael Nadal of Spain on day 14 of the 2017 Australian Open at Melbourne Park. Roger Federer claims the 18th Grand Slam title. Tennis star Roger Federer of Switzerland kisses the Norman Brookes Challenge Cup after winning the Australian Open 2017 Men's Final match. It was amazing and interesting match. 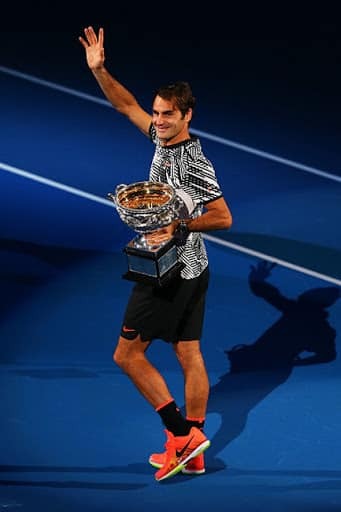 Roger Federer last won the Australian Open in 2010.